The Range Rover Evoque luxury compact SUV has been updated, with new architecture intended to enable a “smooth, quiet and refined” drive. Buyers will have a choice of hybrid-electric engines: a 48V mild-hybrid will be available from launch, with a plug-in hybrid version to be added about a year later. The mild-hybrid powertrain is a first for Land Rover and works by harvesting energy normally lost during deceleration thanks to the engine-mounted belt-integrated starter generator, storing it in the under-floor battery. At speeds below 11mph (17km/h), the engine will shut off while the driver applies the brakes. When pulling away, the stored energy is redeployed to assist the engine under acceleration and reduce fuel consumption. The company says the compact SUV combines all-terrain capability with all-weather assurance. The new Evoque features all-wheel drive, as well as a second-generation Active Driveline with Driveline Disconnect, designed to enhance efficiency and adaptive dynamics to deliver the optimum balance of comfort and agility. Terrain Response 2 automatically detects the surface being driven on and adjusts the set-up accordingly, while the Evoque can now wade through water up to 600mm (23.6in), rather than the previous 500mm (19.69in). The Range Rover command driving position has jumped into the digital age, with a ClearSight rearview mirror that transforms into an HD video screen. If rear visibility is compromised by passengers or bulky items, the driver can flick a switch on the underside of the mirror and a camera feed from the top of the car displays what is behind the vehicle in high definition. The screen provides a wider (50°) field of vision and better visibility in low light. The new Range Rover Evoque also features Ground View technology, which effectively makes the bonnet invisible by projecting camera imagery onto the upper touchscreen to show the driver a 180° view under the front of the vehicle. This is intended to help drivers when negotiating difficult parking spaces, high city center curbs or rough terrain. It is the realization of the Transparent Bonnet technology previewed by Land Rover in 2014. While the car’s footprint is almost unchanged, the new mixed-material Premium Transverse Architecture yields more interior space than before. 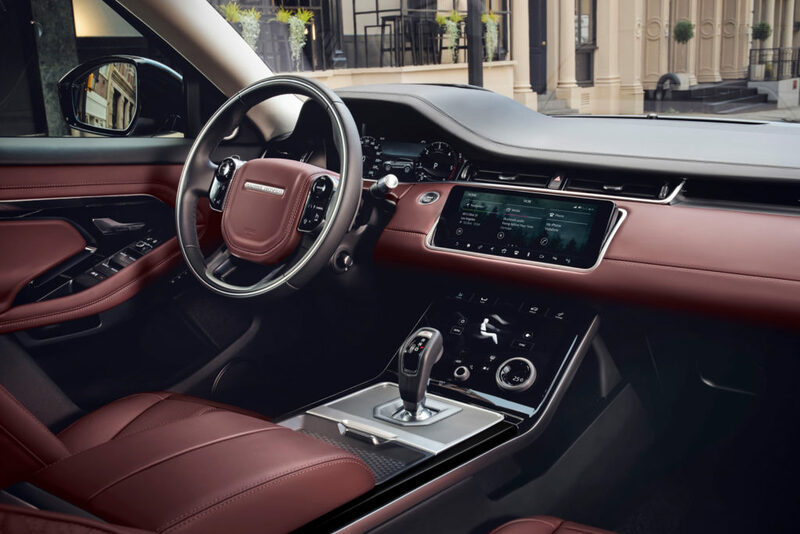 “Underneath the skin is an engineering and technical revolution,” said Nick Rogers, executive director of product engineering at Jaguar Land Rover. “The architecture is all-new to accommodate both plug-in and mild-hybrid systems, with only the door hinges remaining unchanged on the body. The chassis has been significantly reworked to make the most of the stiffer body, ensuring the characteristic ride comfort and refinement of a Range Rover. Evoque is the first Land Rover with Smart Settings, which uses AI algorithms to learn the driver’s preference and acts as an “’onboard butler’. In addition to seat position, music and climate settings, the Evoque can also control steering column preferences.